Brit Decor : Home Page: Brit Decor: Spring/ Howkapow! 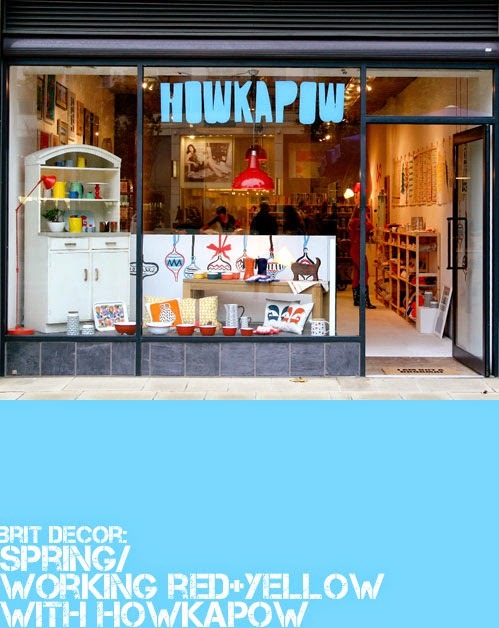 There are so many things to be positive about right now with Spring in the air and one of these has to be Bristol-based online store Howkapow. 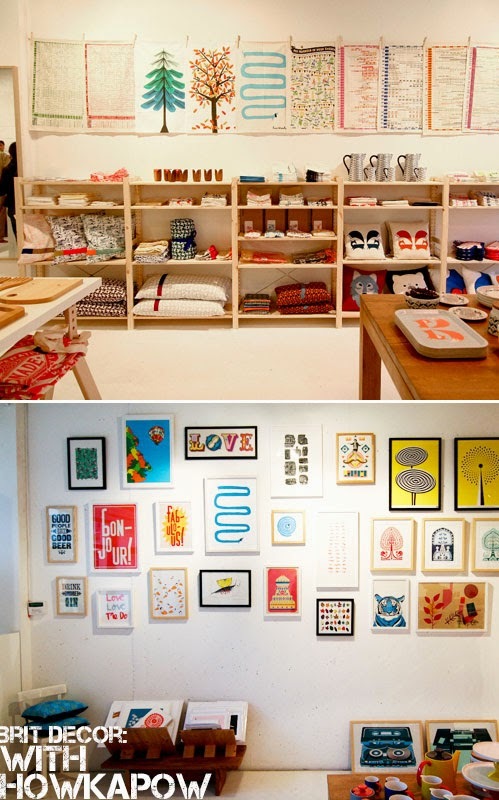 I stumbled across this brand on Twitter several months ago and this is undoubtedly one of those feel-good stores with a range of quirky and bold designs, which always bring a smile to my face. Of course, this is helped along by the equally smile inducing owners, Rog and Cat How - now we're beginning to sense where the name Howkapow came from, right? Add their love of loud and flamboyant design and you have How-meets-Kapow! 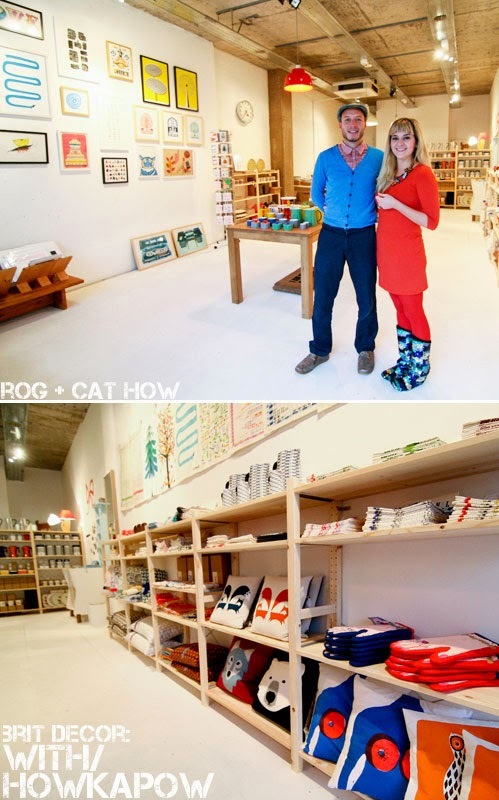 Following Cat's graduation from Central Saint Martins in 2010, the creative duo launched Howkapow, and together with their creative team, Rog and Cat work from the studio-meets-showroom in Bristol's Artisan quarter, Stokes Croft. (Oh and they're on the look out for a the perfect shop location too!). The images 'above' were taken from their recent pop-up shop at the city's Cabot Circus shopping centre and gave a tantalising taste of what me might expect in the future, with exciting gallery walls, pick-me-up products and a collated collection of fun and exciting works from new talents, including one of my favourite Illustrators, @luciesheridan. 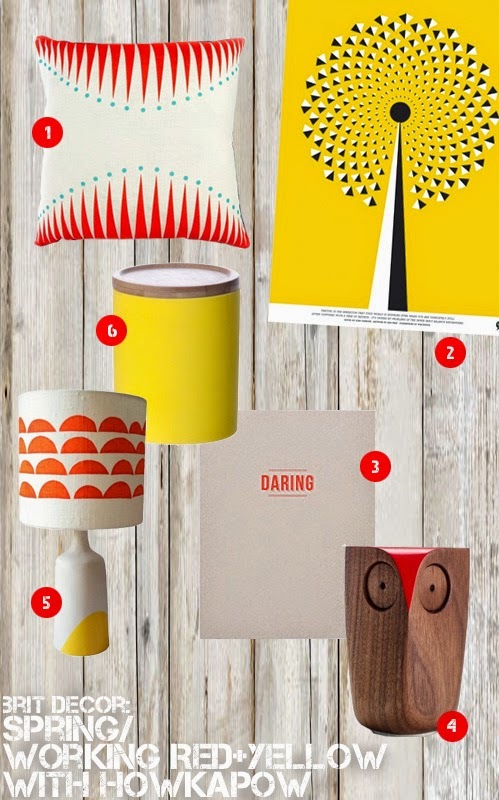 Whilst there is a multitude of colour to explore at Howkapow, today I'm in the mood for some high-contrast with Spring-bright yellows and daring reds, so here's what I picked out 'below'. I love the sharp red triangular detailing of the 'Big Top' cushion (no.1) and the bumblebee palette of the aptly named 'Sensation' print (no.2). My stationery addiction is showing no sign of letting up and no wonder with this 'Daring' notebook (no.3); red and grey are another favourite colour combo of mine! The faithful owl continues to be a must-have home accessory, and this oh-so cute walnut owl (no.4) needs to find a place to nest in my home! Fun, quirky, mid-twentieth Century style, this 'Sunshine Dip' (no.5) lamp ticks all of the right boxes and would look awesome placed on a sideboard. Finally, I defy any kitchen not to look brighter with this gorgeously sunny yellow 'Silk' canister (no.6).